1. You’re off the record. Avoid phone conversations in non-private offices. Build relationships over personal topics through small talk. Facial expressions often communicate so much more than words. By visiting the office you get much more information from the environment. When it comes to coaching and consulting I have found that meeting in person is of course very nice. I would say, to the extent you can, always meet once for an intake/introductory session. The time and effort required for meeting in person is a different equation, why we at Herringbone have decided to differentiate our offerings based on virtual/Skype meetings or in person. That way, we can offer our services to a larger audience, and meet the needs and budgets they – maybe you! – may have. 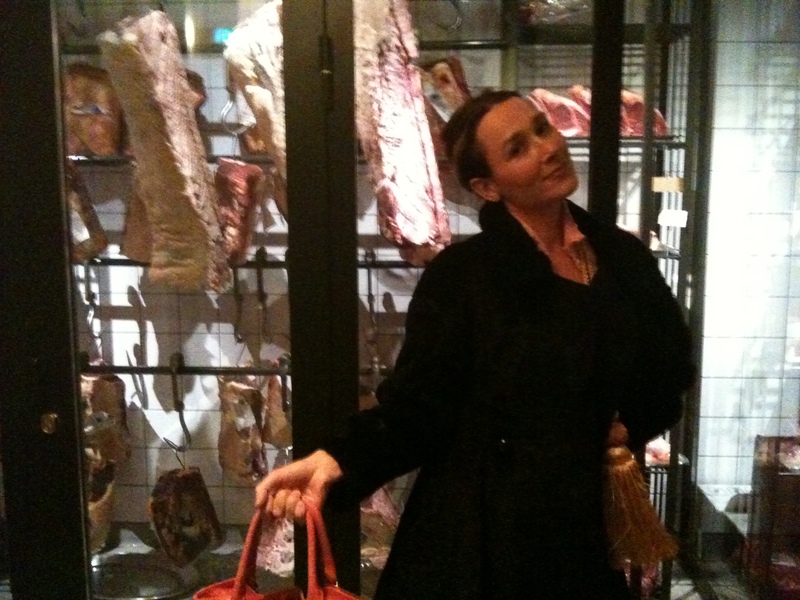 The reason why this article originally made me think of Catrine Näsmark is because when I met her in Sweden a year ago, she made an impression with a pink handbag – at a restaurant that took pride in serving high quality meat. Very obvious as you face the meat fridge by the end of the red carpet leading up from the street entrance. Since then I have had this blog post title and photo in my mind. (Imagine how much is still stored up there…) Taking the photo, I was thinking – this set up of a restaurant would not happen in San Francisco. Although – the title of the blog post is taken from a blog Nice to Meat You originated in San Francisco, by a local entrepreneur friend Willo O’Brien with WilloToons. Thank you for finally letting me share it! 😉 Puh. Below are some interesting facts about the movie – and by now we know that The Artist won 5 Oscars: Best Picture, Directing, Actor In a Leading Role, Costume Design, and Music (Original Score). Compared to the movie Hugo, that also was awarded five Oscars, The artist was ten times less expensive. According to IMDB the estimated budgets were: $15,000,000 (The Artist) compared to $170,000,000 (Hugo) per vikisecrets. All along watching the movie I couldn’t resist relating to The Artist in my world. Without spoken words, she can capture a whole timeline in her portraits. She can convey a story that is both moving deeply, and make you laugh loudly. She incorporates objects and details that are unexpected and humoristic. Her art is original, optimistic and well received. She recently visited San Francisco for some meetings and introductions, planting seeds for her first US exhibition. If Jean Dujardin can entertain in words like Catrine Näsmark, is still a secret to me. 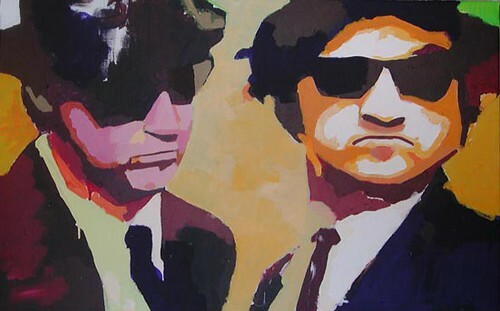 But I am sure he, or any other Oscar winners would appreciate their own portrait done by her. Just like I am sure Marc Zuckerberg would appreciate the portrait Catrine Näsmark has done of him in her last exhibition “United Statements of America”, and how she captured his Facebook Timeline in a quite brilliant way. It’s in the details. Can’t wait for her art to actually take stage in San Francisco. With regards to social media queen or not… I do know that I love what social media offers when it comes to communicating something of importance and meaning, to an audience that needs to hear it and love to share it. Building relationships in a transparent and authentic way across all kinds of borders. Allowing for private and corporate ideas, and dreams to be realized through the traction and support they gain and make them thrive. With that said: may I introduce you to The Artist. 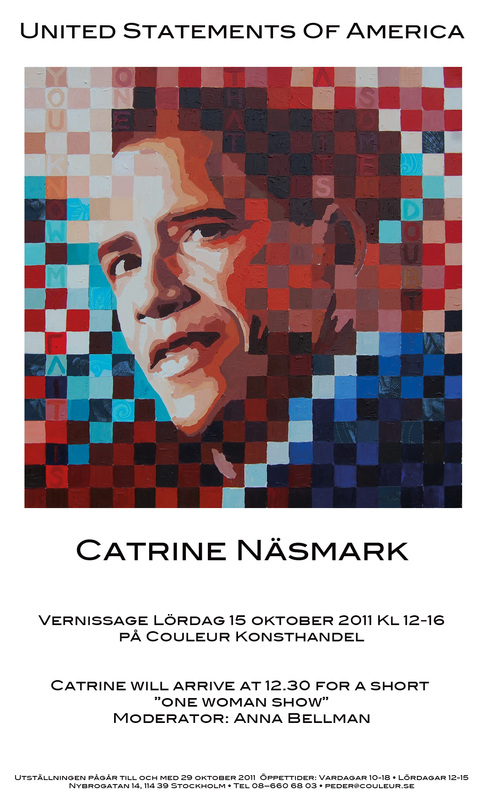 Catrine Näsmark – click here. Final note to self: if something seems old and stale – add a dance and you bring back life to it! 1. Director Michel Hazanavicius, 44, fantasized about making a silent film for many years, both for the image-driven nature of the format and because many of his favorite filmmakers emerged in that era. 2. Hazanavicius studied many silent films to find the right technique in order to make the story comprehensible without the use of too many title cards. 3. The dog actor in the film, Uggy, won the Palm Dog Award for best canine at the Cannes Film Festival in France. The honor can be awarded to live or animated dogs or a group of dogs in films presented at the festival. (The name of the award is a pun on the Palme d’Or, the festival’s highest honor). ‘Up”s Dug is a previous winner. 4. The stars of the film, Berenice Bejo and Jean Dujardin, had to learn to act in an 80-year-old style that has not really been used since the 1920s, and they both had to learn to tap-dance at a professional level for the film. 5. The Weinstein Company’s publicity strategy of plugging ‘The Artist’ into every film festival and letting word-of-mouth seems to be working. The film has won audience awards in at least three film festivals around the world so far. Just felt like expressing – something – of joy. Spring Scream a la Astrid Lindgren’s Ronja Rövardotter (Ronia the Robber’s Daughter). I had forgotten how it sounded like and found it on YouTube. Here it is. Cover your ears. What are you calling for today? Regards from a joyful and sunny San Francisco. Oh yes – today’s shout out goes to Anna Sandgren, my much appreciated team member at Herringbone; Catrine Näsmark, fantastic artist, creator and human being; Will Burke award winning branding expert. Hm… this video makes me listen and appreciate – quietly. What is your unique talent? Are you taking good care of it? Are you sharing it with the world – near and/or far, small or large? Please do. Let us enjoy. Last Sunday I finally got a moment with my client, dear friend and outstanding paintor, Catrine Näsmark – on the run. Quick download of all the updates and decision of which pieces of art to display on the website home page, and shouldn’t there be another color of the logo – which is really Catrine’s art signature. The invitation was to go out the day after. The new website had to be up. Right then and there I just had to stop. Co-creation on the run, with a smile. This is a golden moment. 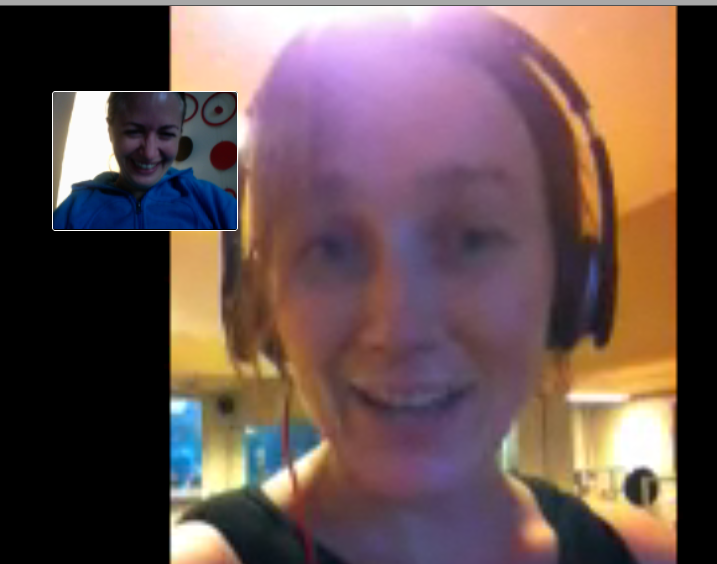 There Catrine is, running on the treadmill in Stockholm, skyping me with her iPhone – and here am I sitting in my yoga clothes ready to walk out the door to the next yoga class in San Francisco. And with permission: this is how it looked like. #Freedom of creation with impact. That was the mantra for this year. How would that look for you? Oh yes – the logo color chosen was red – you would really like to see it, on a painting in your own collection – or maybe your own portrait ;). And the impact? Change the world with colors.